No doubt, one of the premiere, most established festival brands ever. Regularly sold-out with 70,000+ music fans enjoying some of the best concerts the world has to offer. Also showcasing art installations, a street fair and a children’s zone. It’s rock in all its incarnations. Some of the major headliners have included Radiohead, Macklemore & Ryan Lewis, Kings Of Leon, Major Lazer, New Order and Sam Smith. The ‘World of Lolla Berlin’ includes walk-in open-air galleries, artistry, acrobatics, street theatre, sustainability at Der Grüne Kiez (The Green Neighbourhood) and an adventure world for the little ones, Kidzapalooza. Beer, wine and food vendors makes sure you have a lot to choose from, so you don’t get hungry or thirsty. Check its lineup for updates. Lollapalooza Berlin is going cashless. You can top up your wristbands at cashless points using a credit or debit card as well as cash. A processing fee of 1 € per top-up process will apply. By the way, topping up your wristband in advance through your personal festival account is easier and without additional costs. Berlin is full of good hotels and where you want to stay mostly depends on what you want to do and see in this great city. Wher ever you are it’s easy to get to the Olympiastadium with the U or S bahn. 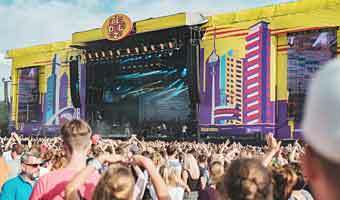 In the west-end of the city and just 500 metres to the S-bahn station Charlottenburg where you get fast connection to the Olympiastadion where the Lollapalooza Berlin festival takes place. 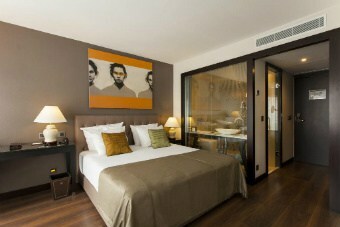 Minutes from Berlin’s main shopping street and the Adenauerplatz Underground Station. It offers a 24-hour reception and modern rooms (most with a private balcony), Italian marble washrooms and a rain shower. Close proximity to other restaurants and bars. International and local multi-genre music, Cultural, creative, an outdoor experiences. A Summer's Tale is a world of its own. Music and performances 3 first weeks of August. Lovely atmosphere by the lake Maschsee in Hannover, with drinks, food and international artists. The annual festival for blues, jazz and funk on Rugen takes place four days in June every year. Blue Wave Festival is the largest music festival on Rugen. Munich Springfest is a lovely celebration of spring and one of Europe's biggest Spring Festivals. One of the most famous events on Rugen island is the annual Störtebeker medieval games in Ralswiek. Ongoing games Mondays to Saturdays. A cozy and relaxing wine festival that let you discover the infinite lightness of wine. It is annually held two weekends in the beautiful Mainz City Park. This three-days pop and rock festival features more than 100 bands from big international names, to well-known local talent and talented newcomers.